Astronomers are still further than they’d like to be to solving the mystery that is dark matter, concentrations of mysterious, invisible energy throughout the universe that may have impacted our own planet more than we think. While they were once thought to be part of a “dark sector,” a hidden quantum field out of the standard model of the universe that just reflects the matter around it. Instead, it may be something more interesting: its particles interact the way that galaxy clusters collide. When this type of event takes place, hot gases filling the gaps between stars within these galaxies begin colliding and splattering in every direction, a movement similar to water hitting and splashing off a flat surface. About 90 percent of the matter in these clusters is actually dark matter – so does dark matter also splatter like water? New research, however, has eliminated this colorful possibility – therefore limiting what types of particles constitute dark matter, and reducing the possibility that they hide away mirrors of our visible universe. How does this work? Our own galaxy has billions of stars – just a miniscule fraction of the hundreds of billions scattered throughout the visible universe – a countless array of stars, planets, galaxies, and then even the debris – the dust and gas that’s responsible for producing all of it – but even this is totals up to just 15 percent of the universe at best. The rest is dark matter – which is detected by its extreme gravitational pull that it exerts on the matter it surrounds. It is impervious to light, neither radiating nor reflecting it. However, they are able to spot the patches of dark matter due to light bending around it. David Harvey, who is a postdoctoral researcher at the Swiss Federal Institute of Technology Lausanne, is among the ranks of scientists actively trying to solve the mystery of dark matter, which led him to study galactic collisions – events where 90 percent of what collides is actually dark matter. What they have learned about these collisions, which feel more like mergers, is that they aren’t as violent as one might think. The stars are often so far apart when they take place that they tend to neatly fold together in place. Between the galaxies, however, lies a heavy blanket of gas crackling with charged particles. Once the galaxy clusters come together, this gas spews in every direction. So far, the researchers compared data from 30 different galaxy-cluster collisions with the help of NASA’s Hubble Space Telescope and the Chandra X-ray Observatory. What they found was equally striking: dark matter appears to behave similar to stars, remaining largely unaffected in the collision. 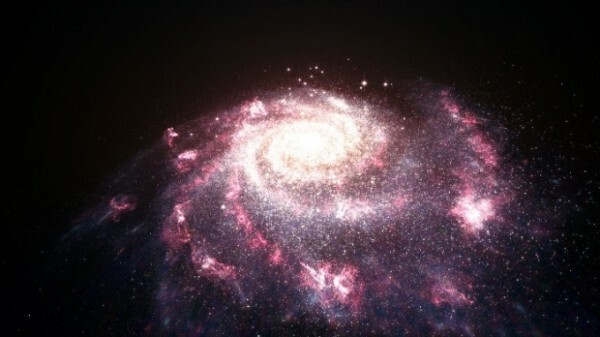 Perhaps these observations suggest that dark matter is made of similar components to stars? So what about the splattering gas? This is due to the gas behaving like a solid, in the same way that liquids bubble and cling together in a microgravity environment. Atomic protons interact in such a way as well. By comparison, dark matter doesn’t behave like a gas, interacting less with its own particles than the protons of atoms interact with each other. This has led many to suspect that dark matter is made up of dark protons or electrons, sort of a mirror version of the atom.